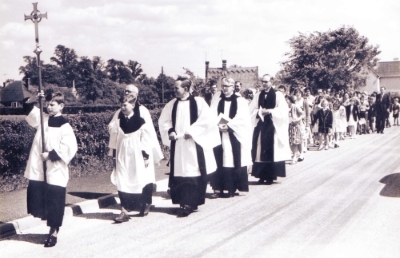 Petersfield Church of England (Aided) Primary School was officially opened on 22nd June 1962. Until that time, primary school aged children had been educated nearby in small village schools. However, by the 1950s numbers of pupils in many of these schools had fallen below sustainable levels and so the local authority began to explore the possibilities for consolidating the small village schools into one larger school, which could serve the whole area. As all but one of these schools were church-run schools, the Diocese of Ely, as well as the Cambridge Education Committee, were involved in the discussions. After three years of negotiations, a suitable site for the new school was eventually found on Hurdleditch Road in Orwell. The land was purchased from Mr H.G Peters, of Manor Farm, Orwell. The land had been known locally as 'Greenbridge Meadow', but it is from Mr Peters that the school gets its name - Petersfield. The construction of the new school building began in 1960. The Archdeacon of Ely led a service of dedication at the site, and Mrs Bambridge of Wimpole Hall planted a commemorative tree, which still grows with vigour outside what is now the head teacher's office. The first head teacher of the school was Mr Basil Waterton. A former naval serviceman, Mr Waterton came to the school from a deputy headship in Buckinghamshire, and was to remain at the school for twenty five years. He was succeeded as head teacher in 1986 by Mrs Barbara Radcliff. The school serves six South Cambridgeshire villages. 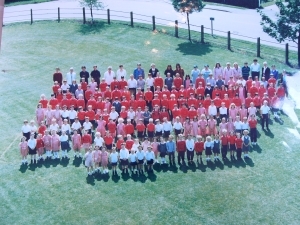 Initially, the school would serve the villages of Orwell, Wimpole, Whaddon, Arrington and Croydon. 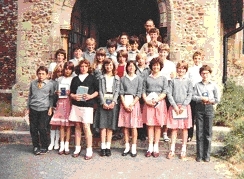 A few years later, the school was pleased to welcome the children of Tadlow as well. the worst winter since 1740! We were thrilled with the community response to our History Wall project and since have published a colourful book entitled 'Petersfield: A Celebration of 50 Years of Success in Learning' which contains a wealth of information about the history of our school. If you would like to receive a copy, please contact us.